Home » General Health » What Causes Morning Sickness? Morning sickness is a condition that normally happens during the morning hours and gets better as the day goes on. It is accompanied by nausea, vomiting, and feeling tired. This sickness typically occurs in women who are pregnant or who take contraceptives. Morning sickness typically occurs during the early morning hours but health experts say that these symptoms can occur at any point during the day for pregnant females. 1. Human chorionic gonadotrophin (hCG) hormones: hCG is a hormone that becomes present when a woman is pregnant. Since the body is not accustomed to this hormone being present, it is possible that this triggers morning sickness during the early stages of pregnancy. hCG is also the hormone that lets women know they are pregnant. 2. Estrogen: This is the hormone known to make females, well, female. This hormone increases during pregnancy and relaxes the uterine muscles. The theory is, however, that the increased levels of estrogen also relax the muscles in the intestines which can lead to nausea and vomiting. 3. Lower blood pressure: The hormonal changes brought on by pregnancy can cause blood vessels to dilate. This leads to lower blood pressure which then causes feelings of dizziness. Some theories also suggest that low blood pressure may be caused by the baby eating away all the nutrients (although this theory isn’t supported by much evidence). 4. Getting rid of toxins: Some experts believe that morning sickness is the body’s way of clearing out toxins that may be bad for the fetus. That is the reason eating very plain foods is said to help with morning sickness, because they contain less toxins. This theory hasn’t been proven scientifically, but it has been around for a long time as a plausible cause of morning sickness. There are other lifestyle factors that can contribute to morning sickness as well, including frequent travel and stress. Again, experiencing these symptoms is normal for women who are pregnant. But if these conditions happen in excess, contact your doctor. There are varying opinions on exactly when symptoms of morning sickness actually kick in. This is probably because every pregnancy isn’t exactly the same. But morning sickness typically begins to appear within the first two to six weeks into a pregnancy, mainly due to the increased hormone production. Morning sickness is actually a good way to tell if you are actually pregnant. Be aware that the symptoms can appear at any point during the day, although symptoms are at their worst during the morning. 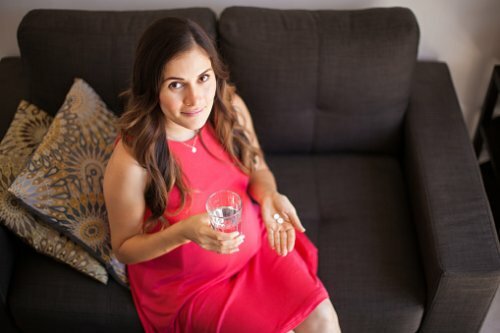 Fight Back Against Morning Sickness! The first thing to know is that no treatment or medication should be taken without speaking to a doctor. There are several natural remedies for morning sickness worth looking into, such as vitamin B6 supplements. They can help reduce the severity and the instances of the condition. For the majority of pregnant women, morning sickness is something they will just have to deal with. Most women experience morning sickness for approximately three to four months (although some can even experience it up until the baby is born). But knowing how to treat it and how to adjust your lifestyle are big factors in how your morning sickness is managed. Nordqvist, C., “Morning Sickness: Symptoms, Causes and Treatments,” Medical News Today web site, July 3, 2015; http://www.medicalnewstoday.com/articles/179633.php?page=2. “What causes morning sickness? 3 possible conditions,” Healthline web site; http://www.healthline.com/symptom/morning-sickness, last accessed December 22, 2015.